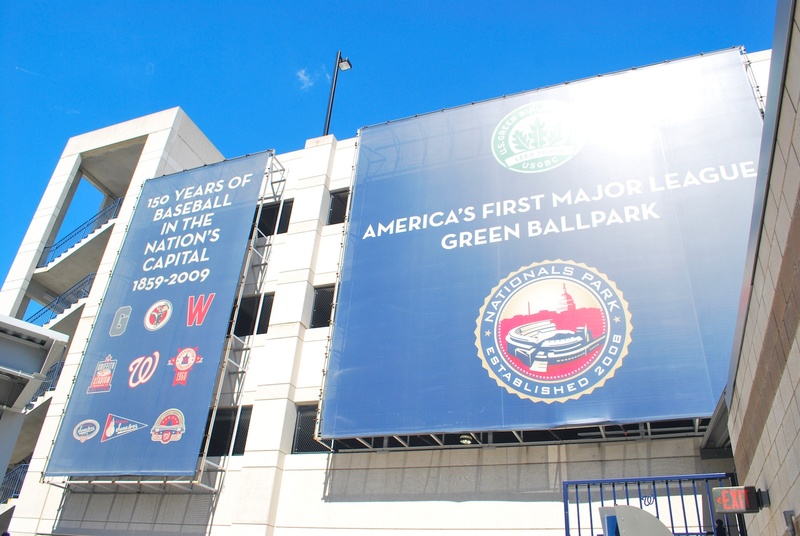 Monday’s finale was a 1:05 start and the original plan was to drive down to the Forest Glen Metro stop and take the red line to the green line to get to Nationals Park. I wanted to do this so when I returned to my car after the game I’d be closer to the outskirts of the DC Metropolitan area. I got to the Forest Glen park and ride around 10:45 only to find every single one of the 596 parking spaces taken. I didn’t physically see that every spot was taken but after going up and down a few rows and seeing the sign that said “Parking lot full?” (with suggestions) I knew it fills up regularly. When I got there another car was going up and down the aisles and after I drove past the lot 5 minutes later they were still doing it, confirming my assumption. I considered driving over a curb, parking in the grass and throwing an invisibility cloak over my car, but then I remembered that Harry Potter had joined me for Friday’s game only. I drove north to the Wheaton park and ride but I couldn’t find it. There was a sign that said park and ride with an arrow pointing right. I turned right but never saw another sign for the park and ride. I drove around a mall looking for an additional sign but didn’t see anything. I was getting a little nervous about the time so I decided to head back to the Greenbelt Metro stop because I knew where it was. The Greenbelt station has over 3,300 spaces and luckily there were still a couple hundred left (I think). 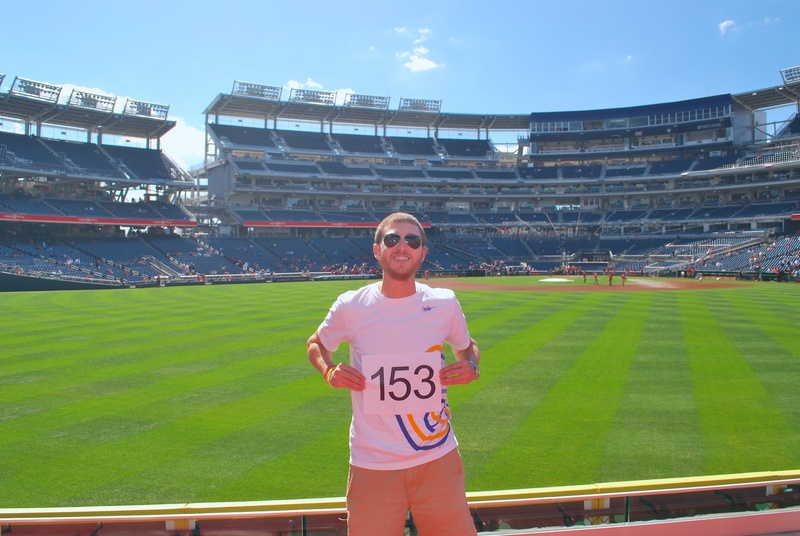 I was inside Nationals Park at 12:18 and I’m glad I had wanted to get there extra early. If I had planned on getting there at 12:30 I probably would’ve missed the first inning. I went to the Red Porch seats for game photo number 153. If I look to be tinted a little red it’s because the red seats reflected their color pretty well. 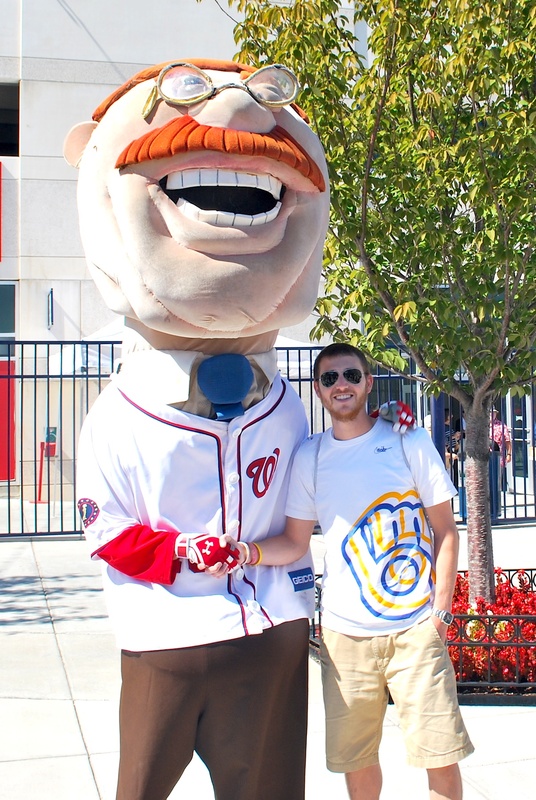 After getting the picture taken I went to the area just inside the centerfield entrance and got my picture taken with Teddy. I whispered in his giant ear that he’d win one of these days. 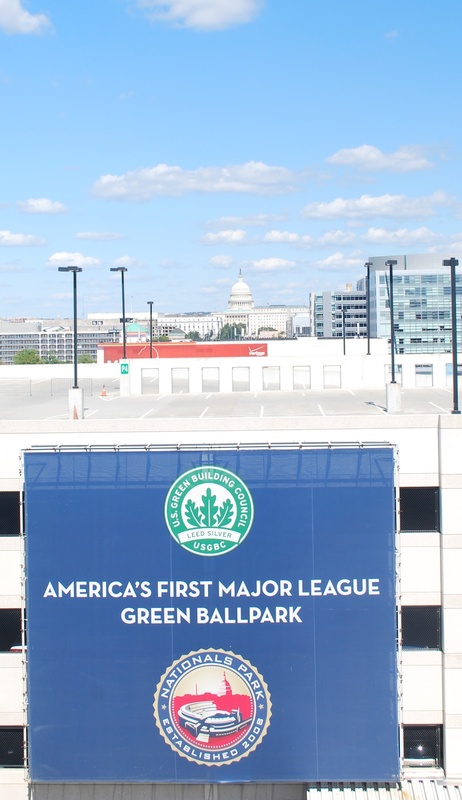 I wandered a little and noticed a few banners on the parking garage beyond the left field corner. The sun’s reflection washes out the green certification logo, but you get the picture. They are both kind of small so you can click on the images to view a bigger picture. 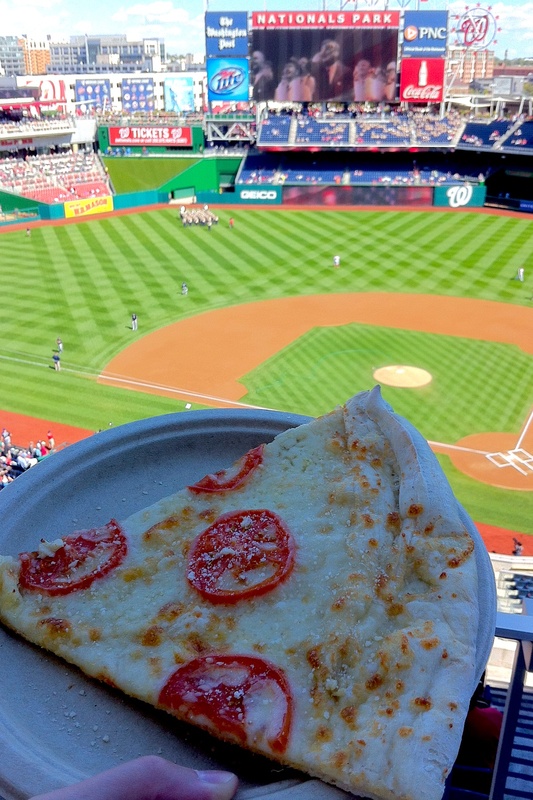 I walked towards the elevators near home plate in the upper deck and got a slice of tomato basil pizza at one of the concession stands. Not amazing, but still good. The concession stand workers refer to it as “Tom-B” in case you were wondering. I took the elevator down to the main concourse and went to my seat in section 128. My former coworker’s husband works for a firm that also has an office in DC. John (who works in the DC office) was visiting Madison and went to Mallards game in June with people from my former place of employment. Pam (my former coworker) told John about what I was doing and he reached out to me. He offered me one of his season tickets for Monday’s game. Thanks John! 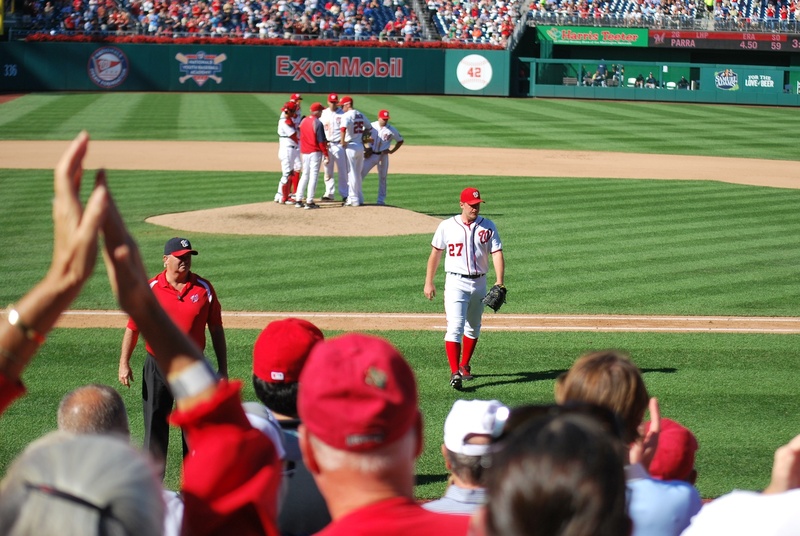 Jordan Zimmermann, who grew up in Auburndale, WI, was on the mound for the Nationals. My girlfriend, Victoria, went to school in Auburndale through the 2nd grade (OMG!!!). I hate OMG and LOL so I use them as a joke sometimes. 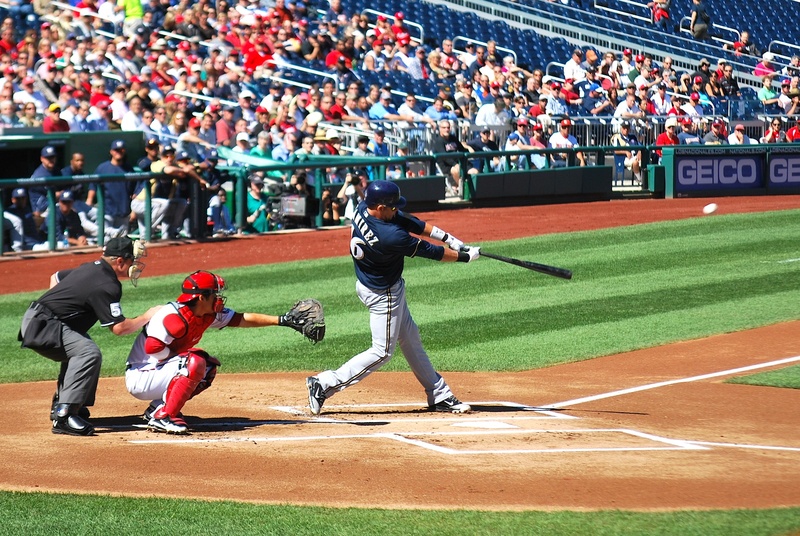 The first pitch of the game was a called strike to Aoki. …. 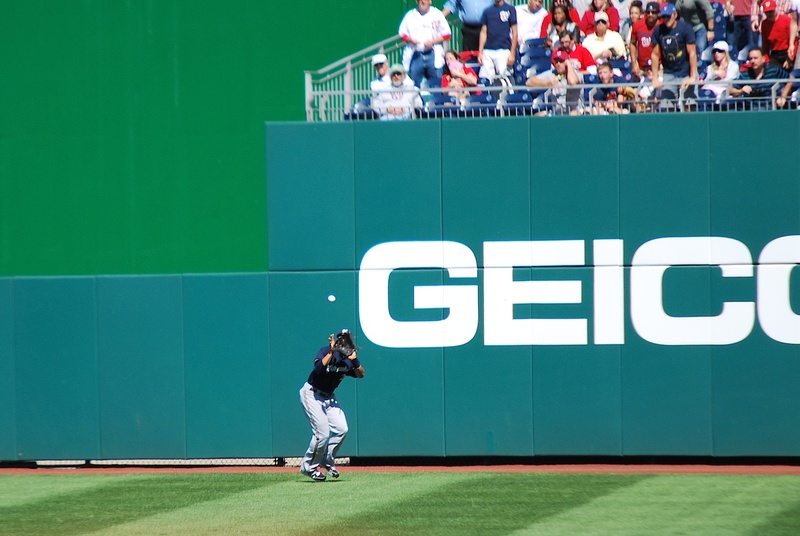 where it was caught by 19-year-old Bryce Harper before crashing into the wall. Kids these days, I tell ya. A few of his teammates waited on the field to show their appreciation for his efforts. 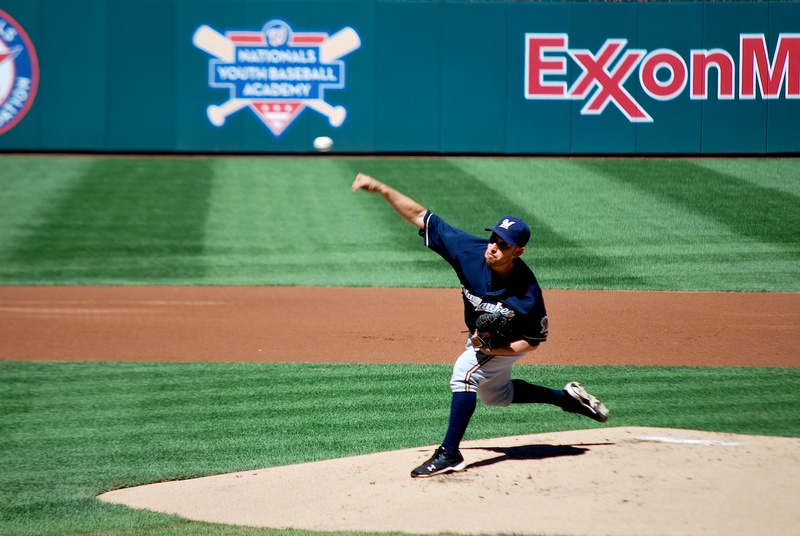 Marco Estrada started for the Brewers, and here he is shortly after releasing the first pitch of his outing. 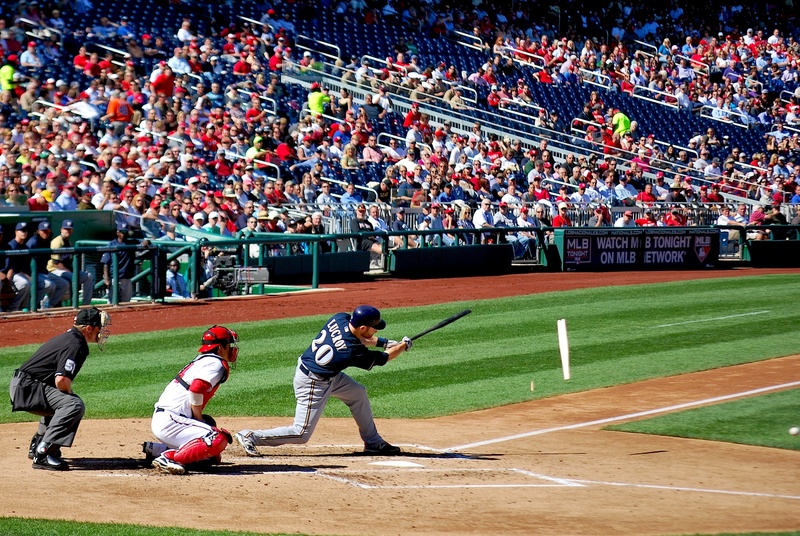 The Nationals took a 1-0 lead when Harper stole third base and then scored when Lucroy’s throw sailed into left field. 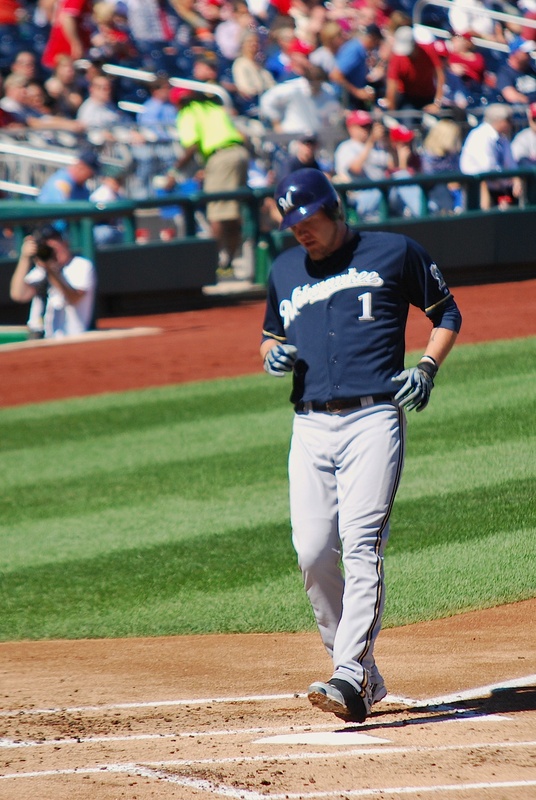 The Brewers got that run back in a hurry when Corey Hart homered on the first pitch of the 2nd inning. Hart is playing through a partial tear to some tissue in the arch of his foot. You the man, Corey! In the top of the 4th Jonathan Lucroy grounded out to end the half inning and he broke his bat in the process. 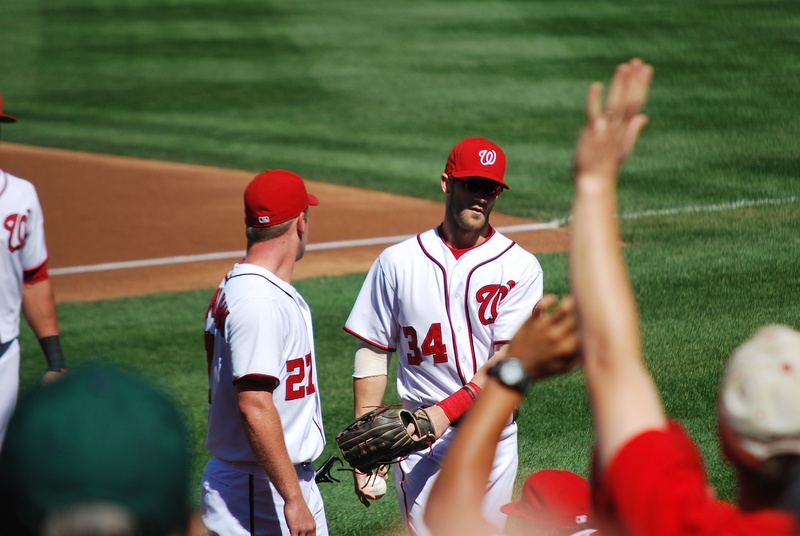 The bottom of the 4th was a tough pill to swallow and the Nationals erupted for 6 runs. With two outs and two on Estrada was facing the pitcher which is normally a good position to be in. Zimmermann helped his own cause and he drove in Bernadina with a single. The next batter was Jayson Werth and he lifted what seemed to be a harmless fly ball to centerfield. It looked like Gomez had it all lined up but then at the last second he darted to his left and dove for the ball. It hit off the heel of his glove and it goes down as a sun-assisted 2-run double for Werth. Ugh. 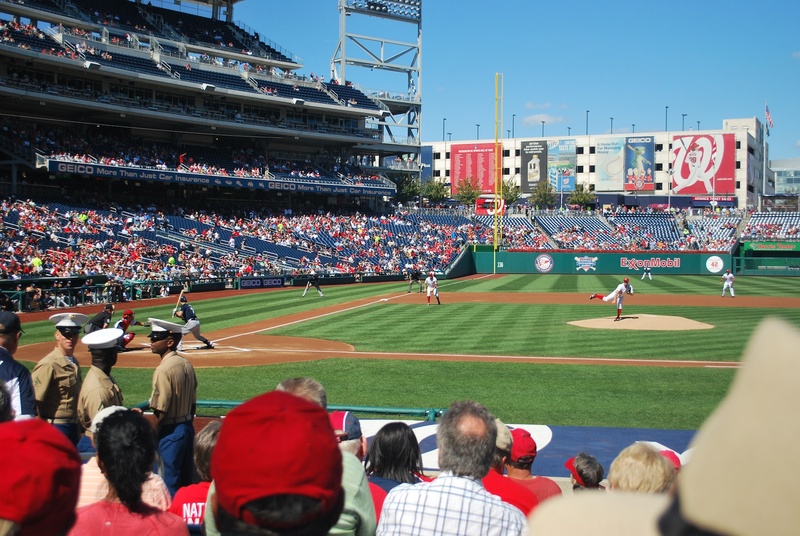 Harper walked and then Ryan Zimmerman connected for a 3-run home run to wrap up the inning to forget. The Nats scored two more in the 5th and it appeared the game was out of reach. I tweeted this yesterday but I felt like if there was ever a game to leave early, this was it. I wanted to get on the road to start my 500 mile drive and a 7-run deficit, while not insurmountable, is pretty close. I couldn’t do it though and I stayed for the remainder of the game. Zimmermann departed after six and two thirds to a nice ovation from the home crowd. He gave up 4 hits, 2 walks, and 1 run while striking out 7. 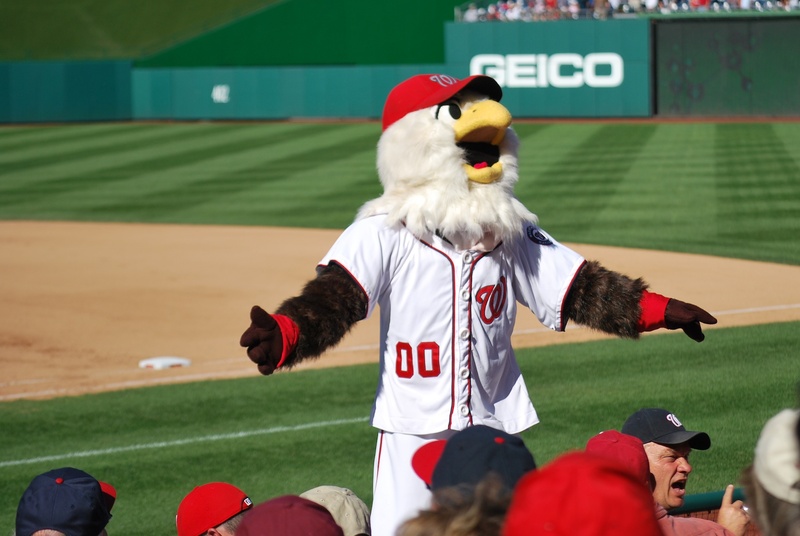 During the 7th inning stretch Screech (the Nationals mascot) was on top of the home dugout. On a side note, shouldn’t he have wings and not arms? Ramirez hit his 50th double of the season in the 8th inning to drive in Braun. The Nationals answered with three runs of their own in the bottom half. Final score: Nationals 12 – Brewers 2. That’s not a pretty linescore if you’re a Brewers fan. 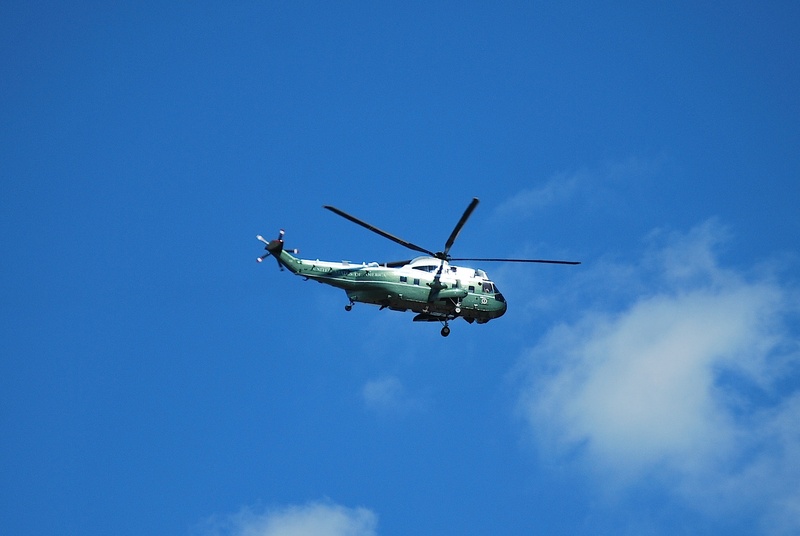 Early in the game a helicopter flew overhead and after some zooming I realized that it’s Marine One. 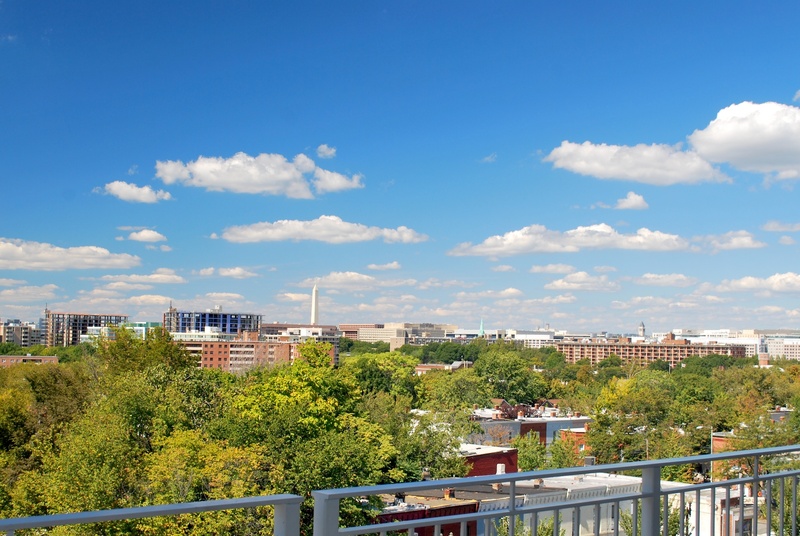 I took the green line back to the Greenbelt station and left DC after the Brewers split the four game series. I made a pit stop on I-70 to handle some business. I got my license plate back! I won’t go into too much detail but I’m just glad I won’t be needing to buy replacement plates now. I stopped for gas and some snacks at 11:10 and then drove the remaining three hours to Cincinnati. My knee has gotten to the point that I am considering encasing myself in bubble wrap so I can just log roll everywhere I need to go (that might hurt just as much so I’ll keep brainstorming). It’s 2:30 PM on Tuesday afternoon and Barry (who has joined me for 4 of the 6 games at Great American Ballpark) got us nice all-you-can-eat seats (not ballpark food) in the club level. Between the hours of 8 PM and 6 AM there is between a 50 and 70% chance of rain: this should be interesting.